In 1985, however, the Lakers avenged the loss, defeating the Celtics in game 6 of the Finals in the Boston Garden. In a losing effort against Los Angeles, Bird averaged 23.8 points on .449 shooting, 8.8 rebounds and 5.0 assists per game. That year, the NBA again named Bird the league MVP. A Bird-Magic Finals rematch was held the following season, and this time Magic won. After the Celtics won the first game by 34 points, the Lakers won four of the next five. During that regular season, Bird scored his career high, notching 60 points (37 in the second half) against Atlanta. Bird was second in the league in scoring (28.7) and 3-point shooting (42.7 percent) in retaining the league MVP award. 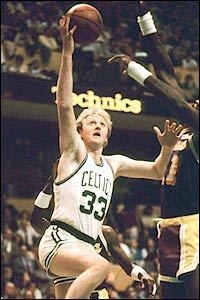 Bird's scoring average soared to 28.7 points in 1984-85, the second-highest mark in the league and the second highest of his career. He boosted that average with a career-best 60 points against Atlanta. He also canned 56-of-131 three-point attempts for a .427 percentage, second in the NBA behind the Lakers' Byron Scott. Injuries to Bird's elbow and fingers, however, contributed to the Celtics' six-game loss to the Lakers in the 1985 Finals. Nevertheless, at season's end Bird won his second consecutive NBA Most Valuable Player Award.